P.J.M. Rhododendron’s bloom in late April with that brilliant show of lavender. There are a few varieties of P.J.M. that have slight different shades of purple to a light pink flower. Planted in masses with some forsythia mixed in make for a great show. The winter foliage of the P.J.M. is burgundy and shows quite nicely against a snowy background. It’s a zone 4 plant that likes full/partial sun so it will do fine with 3 plus hours of sun a day. P.J.M. 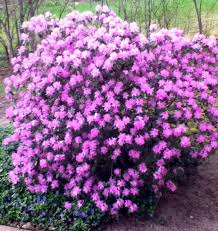 Rhododendron’s grow to 5-6’ with a 5-6’ spread. There is a compact clone available if your space is only 3’-4’. This entry was posted in Gardening, Landscaping, new hampshire, Plantings, shrubs, spring and tagged flowers, garden, gardening, home, landscape, Landscaping, lavender, new hampshire, NH, plant, planting, plantings, rhododendron, rhododendrons, shrub, shrubs, spring, yard. Bookmark the permalink.